Roman historian. 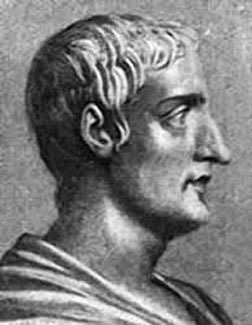 Tacitus, who ranks beyond dispute in the highest place among men of letters of all ages, lived through the reigns of the emperors Nero, Galba, Otho, Vitellius, Vespasian, Titus, Domitian, Nerva and Trajan. All we know of his personal history is from allusions to himself in his own works, and from eleven letters addressed to him by his very intimate friend, the younger Pliny. The exact year of his birth is a matter of inference, but it may be approximately fixed near the close of the reign of Claudius. Pliny indeed, though himself born in 61 or 62, speaks of Tacitus and himself as being "much of an age", but he must have been some years junior to his friend, who began, he tells us, his official life under Vespasian, no doubt as quaestor, and presumably tribune or aedile under Titus (80 or 81), at which time he must have been twenty-five years of age at least. Of his family and birthplace we know nothing certain; we can infer nothing from his name Cornelius, which was then very widely extended; but the fact of his early promotion seems to point to respectable antecedents, and it may be that his father was one Cornelius Tacitus, who had been a procurator in one of the divisions of Gaul, to whom allusion is made by the elder Pliny in his Natural History (VII, 76). But it is all matter of pure conjecture, as it also is whether his "praenomen" was Publius or Gaius. The most interesting facts about him to us are that he was an eminent pleader at the Roman bar, that he was an eyewitness of the "reign of terror" during the last three years of Domitian, and that he was the son-in-law of Julius Agricola. This honorable connection, which testifies to his high moral character, may very possibly have accelerated his promotion, which he says was begun by Vespasian, augmented by Titus, and still further advanced by Domitian, under whom we find him presiding as praetor at the celebration of the secular games in 88, and a member of one of the old priestly colleges, to which good family was an almost indispensable passport. Next year, it seems, he left Rome, and was absent until 93 on some provincial business, and it is possible that in these four years he may have made the acquaintance of Germany and its peoples. His father-in-law died in the year of his return to Rome. In the concluding passage of his Life of Agricola he tells us plainly that he witnessed the judicial murders of many of Rome's best citizens from 93 to 96, and that being himself a senator he felt almost a guilty complicity in them. With the emperor Nerva's accession his life became bright and prosperous, and so it continued through the reign of Nerva's successor, Trajan, he himself, in the opening passage of his Agricola, describing this as a "singularly blessed time", but the hideous reign of terror had stamped itself ineffaceably on his soul, and when he sat down to write his History he could see little but the darkest side of imperialism. To his friend the younger Pliny we are indebted for the little we know about his later life. He was advanced to the consulship in 97, in succession to a highly distinguished man, Verginius Rufus, on whom he delivered in the senate a funeral eulogy. In 99 he was associated with Pliny in the prosecution of a great political offender, Marius Priscus, under whom the provincials of Africa had suffered grievous wrongs. The prosecution was successful, and both Tacitus and Pliny received a special vote of thanks from the senate for their conduct of the case. it would seem that Tacitus lived to the close of Trajan's reign, as he seems to hint at that emperor's extension of the empire by his successful Eastern campaigns from 115 to 117. Whether he outlived Trajan is matter of conjecture. It is worth noticing that the emperor Tacitus in the 3rd century claimed descent from him, and directed that ten copies of his works should be made every year and deposited in the public libraries. He also had a tomb built to his memory, which was destroyed by order of Pope Pius V in the latter part of the 16th century. Pliny, as we see clearly from several passages in his letters, had the highest opinion of his friend's ability and worth. He consults him about a school which he thinks of establishing at Comum (Como), his birthplace, and asks him to look out for suitable teachers and professors. And he pays him the high compliment, " know that your Histories will be immortal, and this makes me the more anxious that may name should appear in them." The following is a list of Tacitus's remaining works, arranged in their probable chronological order, which may be approximately inferred from internal evidence: (1) the Dialogue on Orators, about 76 or 77; (2) the Life of Agricola, 97 or 98; (3) the Germany, 98, published probably in 99; (4) the Histories (Historiae), completed probably by 115 or 116, the last years of Trajan's reign (he must have been at work on them for many years); (5) the Annals, his latest work probably, written in part perhaps along with the Histories, and completed subsequently to Trajan's reign, which he may very well have outlived. The Dialogue on Orators discusses, in the form of a conversation which Tacitus professes to have heard (as a young man) between some eminent men at the Roman bar, the causes of the decay of eloquence under the empire. There are some interesting remarks in it on the change for the worse that had taken place in the education of Roman lads. The style of the Dialogue is far more Ciceronian than that of Tacitus's later work, and critics have attributed it to Quintilian; but its genuineness is now generally accepted. It is noticeable that the mannerisms of Tacitus appear to develop through his lifetime, and are most strongly marked in his latest books, the Annals. The Life of Agricola, short as it is, has always been considered an admirable specimen of biography. The great man with all his grace and dignity is brought vividly before us, and the sketch we have of the history of Britain under the Romans gives a special interest to this little work. The Germany, the full title of which is "Concerning the geography, the manners and customs, and the tribes of Germany", describes with many suggestive hints the general character of the German peoples, and dwells particularly on their fierce and independent spirit, which the author evidently felt to be a standing menace to the empire. The geography is its weak point; much of this was no doubt gathered from vague hearsay. Tacitus dwells on the contrast between barbarian freedom and simplicity on the one hand, and the servility and degeneracy of Roman life on the other. The Histories, as originally composed in twelve books, brought the history of the empire from Galba in 69 down to the close of Domitian's reign in 97. The first four books, and a small fragment of the fifth, giving us a very minute account of the eventful year of revolution, 69, and the brief reigns of Galba, Otho and Vitellius, are all that remain to us. In the fragment of the fifth book we have a curious but entirely inaccurate account of the Jewish nation, of their character, customs and religion, from a cultivated Roman's point of view, which we see at once was a strongly prejudiced one. The Annals -- a title for which there is no ancient authority, and which there is no reason for supposing Tacitus gave distinctively to the work -- record the history of the emperors of the Julian line from Tiberius to Nero, comprising thus a period from AD 14 to 68. Of these, nine books have come down to us entire; of books V, XI, and XVI we have but fragments, and the whole of the reign of Caligula, the first six years of Claudius, and the last three years of Nero are wanting. Out of a period of fifty-four years we thus have the history of forty years. The principal manuscripts of Tacitus are known as the "first" and "second" Medicean -- both of the 10th or 11th centuries. The first six books of the Annals exist nowhere but in the "first Medicean" manuscript, and an attempt was made in 1878 to prove that the Annals are a forgery by Poggio Bracciolini, an Italian scholar of the 15th century, but their genuineness is confirmed by their agreement in various minute details with coins and inscriptions discovered since that period. Moreover, Ruodolphus, a monk, writing in the 9th century, shows that he is acquainted with a manuscript of Tacitus containing at least the two first books. Add to this the testimony of Jerome that Tacitus wrote in thirty books the lives of the Caesars and the evidence of style, and there can be no doubt that in the Annals we have a genuine work of Tacitus. Much of the history of the period described by him, especially of the earlier Caesars, must have been obscure and locked up with the emperor's private papers and memoranda. As we should expect, there was a vast amount of floating gossip, which a historian would have to sift and utilize as best he might. Tacitus, as a man of good social position, no doubt had access to the best information, and must have talked matters over with the most eminent men of the day. There were several writers and chroniclers, whom he occasionally cites but not very often; there were memoirs of distinguished persons -- those, for example, of the younger Agrippina, of Thrasea, and Helvidius. There were several collections of letters, like those of the younger Pliny; a number, too, of funeral orations; and the "acta senatus" and the "acta populi" or "acta diurna", the first a record of proceedings in the senate, the latter a kind of gazette or journal. Thus there were the materials for history in considerable abundance, and Tacitus was certainly a man who knew how to turn them to good account. He has given us a striking, and on the whole doubtless a true, picture of the empire in the 1st century. The rhetorical tendency which characterizes the "silver age" of Roman literature, gives perhaps exaggerated expression to his undoubtedly strong sense of the badness of individual emperors, but he assuredly wrote with a high aim, and we may accept his own account of it: "I regard it as history's highest function to rescue merit from oblivion, and to hold up as a terror to base words and actions the reprobation of posterity." He is convinced of the degeneracy of the age, though it be relieved by the existence of truly noble virtues: and he connects this degeneracy more or less directly with the imperial regime. But it is difficult to dogmatize as to Tacitus's political ideals. He is primarily concerned rather with ethics than with politics; though he may feel that the world is out of joint -- with whatever sentimental sympathy he may regard the age of "liberty", and admire the heroic epoch of the republic-- yet he appears to realize that the empire is a practical necessity, and to the provinces even a benefit. Like the Stoics, with whom otherwise he has little in common, he censures rather individual rulers than the imperial system. But "the key to the interpretation of Tacitus", it has been well said, "is to regard him as a moralist rather than a politician." Perhaps the strongest work in the Annals and Histories is the delineation of character. Tacitus gives us no certain clue to his religious belief. His expressions of opinion about the government of the universe are difficult to reconcile with each other. There seems to have been a strange tinge of superstition about him, and he could not divest himself of some belief in astrology and revelations of the future through omens and portents, though he held these were often misunderstood and misinterpreted by charlatans and impostors. On the whole he appears to have inclined to the philosophical theory of "necessitarianism", that every man's future is fixed from his birth; but we must not fasten on him any particular theory of the world or of the universe. Sometimes he speaks as a believer in a divine overruling Providence, and we may say confidently that with the Epicurean doctrine he had no sort of sympathy. Whatever judgment may be passed on Tacitus' style, it is certainly that of a man of genius, and cannot fail to make a deep impression on the studious reader. Tacitean brevity has become proverbial, and with this are closely allied an occasional obscurity and a rhetorical affectation which his warmest admirers must admit. He has been compared to Thomas Carlyle; and both certainly affect singularity of expression. But they are alike only in the brevity of sentences; and the brevity of Carlyle is not that of an artist in epigram. Tacitus was probably never a popular author; to be understood and appreciated he must be read again and again, or the point of some of his acutest remarks will be quite missed.